Inscribed verso with title and address at 17 Harcourt St.
John Philip Peacan ranks amongst the rarest of all Irish artists and were it not for his work in France at the close of the 19th century, he might have escaped our attention entirely. Not one single painting has appeared on the market in modern times, which might suggest the he did not sign his work, as is the case with the current example. However, we can build a profile of his output through the records of the Royal Hibernian Academy where he exhibited regularly from 1879 to 1898 and it is no surprise to discover a pattern similar to that of his compatriots working in France at the time. Very little is known about his early career but he may have studied in London. His first exhibit at the RHA was a study entitled The Model’s Rest, which he sent from Portland Road, Notting Hill. Other London works at the RHA include Our Studio Pet; A Peep into Moore’s Melodies; One of the Arabi’s Followers; A Difficult Problem; and a number of portraits. His first Irish painting at the Academy was Ireland’s Eye from Dollymount, which he sent there in 1884 from an address at 69 Harcourt Street. This is the same year as his first French painting, A View on the Seine, which may have been done on a very small panel, judging by the price of two guineas. By the following year, Peacan had moved to number 17 Harcourt Street and it is from this address that he sent the current Moret-sur-Loing painting to the RHA. In 1886, works such as A French Cow Girl; and A Grey Day, Moret were included with three other works, which might also have been painted in France. One is reminded of similar titles by Frank O’Meara who was also painting on the Loing about this time and it is interesting to compare the simple dwelling here with O’Meara’s Towards Night and Winter in the Municipal Gallery, Dublin. Other titles such as A Shady Corner; Sad News; and Amongst the Marguerites are reminiscent of Nathaniel Hill and Walter Osborne. Peacan’s last French work, A View, Picardie, was shown in 1887. In 1889 Peacan exhibited a work entitled No place Like Home and it is open to speculation whether or not there was more to the work than the title suggests. However, his pattern continued to fall in line with artists such as Aloysius O’Kelly and Walter Osborne with West of Ireland scenes sent to the annual exhibition from his new address in Roundstone, Co. Galway. 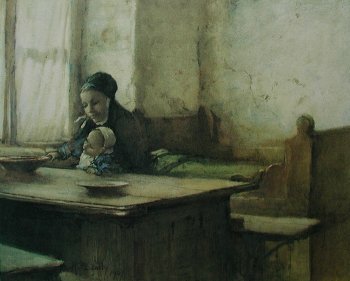 Apart from a Connemara lake scene of 1895, these later works focus on interior scenes with titles such as Her First Situation; Domestic Economy; Home Manufacture, Connemara; and The Seamstress. Returning to the current work, the poplars surrounding our dwelling were immortalised by Alfred Sisley in his paintings along the river. Sisley moved to Moret in 1880 and joined a band of great Impressionist and Post Impressionist painters who worked there. Amongst these was Edmond Charles Joseph Yon who painted a fine scene of the town as it rises above the bridge. It takes in the Church, the old tower and a wide expanse of water immediately below the bridge. 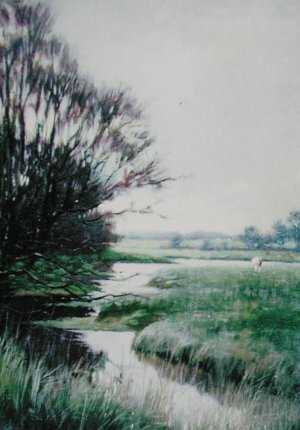 A rider on a white horse fords the river and makes his way towards the soaring poplars on the far bank. These are of interest to us as it may well be that these poplars are a continuation of the specimens shown in Peacan’s painting. The house on the water’s edge appears to be that of a bargeman and it makes sense that he would reside in close proximity to the town. River transport was a vital factor in the establishment of Moret-sur-Loing as the main town of the canton of Seine-et-Marne. 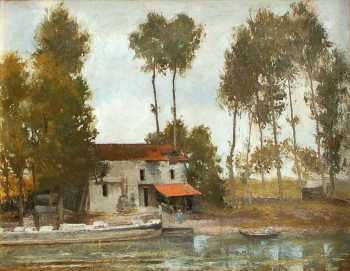 However, by the time Peacan had arrived there, the dominance of the river had been superseded by the railways, which allowed artists to travel the short distance from their Paris studios and establish colonies in the small villages of Barbizon; Fontainebleau, Bourron, Marlotte and elsewhere. The first arrivals were attracted by the activities of village and forest life. Others were entranced by the scenery along the river and colonies were founded at St. Mammes; Moret-sur-Loing and a few miles further south at Grez, with artists arriving by boat and on foot. The barge in Peacan’s painting is well loaded and would have been used to ferry local produce into the centre of Paris returning with general supplies for the villages. The bargeman sits in the sunshine outside his dwelling, perhaps waiting for further cargo to arrive. He watches the activities of another boatman who lands his catch of fish netted on the river. Distinctive red tiles cover the roof and the lean-to workshop and add a degree of warmth and radiance to the painting. The simplicity of the subject matter is reflected in Peacan’s approach to the painting itself; there is no evidence of reworking or fussing over detail and he reflects in the painting an aura of tranquillity, which must have been what attracted him to the scene in the first place. Helen Mabel Trevor made a number of visits to Normandy and Brittany during the 1880s and 1890s. Many of these journeys are recorded in ‘Ramblings of an Artist’, illustrated by her own sketches in pen and ink, published in London in 1901. She also worked in Douarnenez and was particularly fond of Concarneau, where she spent the winter of 1895 in the company of her sister. 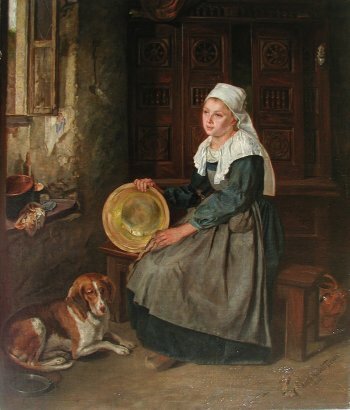 Painted in 1881, this newly discovered painting is one of her first Breton works, most of which illustrate the daily life of the Breton people. From her distinctive costume, Catherine Puget has identified the girl as a native of Pont-Aven. This is further confirmed by the style of the box bed in the background. These were enclosed beds, usually with sliding doors. As part of the furniture of the main room, they were very decorative, with open fret or spindle work panels. This allowed for light and ventilation. The style varied from village to village. In winter, the heavy curtain, seen here above the box bed, would be pulled down over the doors for additional warmth and comfort. The painting is full of interesting detail, such as the knitting that sits on the ledge and the holy water font on the frame of the bed, behind which is a sprig of palm. A print of the Sacred Heart hangs inside the window. Even though a large section has been torn away, the print occupies a prominent position in the simple interior. The costume is very well depicted. The girl wears loose sleeves, pulled up beyond her elbows which, with the help of her apron, protect her clothing as she works. Another pot sits on the window ledge with a collection of rags. The bottle at the back of the ledge probably contains the cleaning polish. A finished vessel sits on the floor behind the girl and sparkles in the sunlight flooding through the window. The strong light throws the stark white of the girl’s costume into sharp contrast with the dark finish of the box bed. There is a glimpse of the outside buildings through the open window. It is tempting to suggest that the girl dreams about being outside and free from the monotony of her daily chores. This theme almost certainly identifies the work as A Morning Dream, exhibited at the Society of Women Artists in 1886. Henry Allan was born on the 18th June, 1865, at Retreat House, Dundalk, the youngest son of William Allan and his wife Anne. After studying in Belfast and Dublin, he continued his art education in Antwerp. He returned to Ireland in 1889 and lived for a year or two in Downpatrick before moving to Dublin. According to Dr. Julian Campbell, he shared lodgings in Antwerp with Moynan and Edwin Hill. He probably knew van Gogh, who was also a student there at the time. He won a number of prizes at the Antwerp Academy and the Taylor prize at the R.D.S. He made his debut at the R.H.A. in 1889 with a painting entitled Country Road near Antwerp. There is a strong possibility that this is the current painting. The high bonnet, shawl and apron worn by the woman are typical of Flemish costume of the day. The scene depicts a family group returning from the river where they have gone to draw water. The water jar is carried on the back of a donkey, led by a man with a distinctive hat and red waistband. The woman carries a basket and leads a small child by the hand. The child wears a bonnet similar to that of her mother. Allan’s work is extremely rare on the market today. It may be that most of his work was destroyed. The National Gallery of Ireland holds one example, A Dutch Interior, bequeathed by Joseph Malachy Kavanagh in 1912. Painted in the manner of Josef Israels, it was included in ‘The Irish Impressionists’ exhibition in 1984. His Royal Hibernian Academy exhibits give an insight into his work. The subject matter was varied. 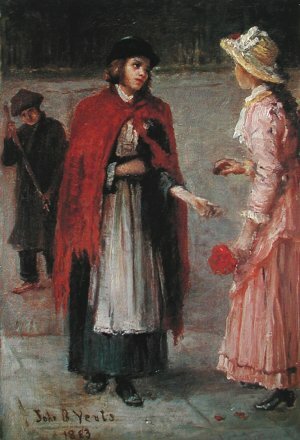 One of his most successful pieces, The Little Matchseller, was awarded the Albert prize at the R.H.A. in 1893. Other works of this type were An Old Beggarwoman; A Flower Seller; Rag-Pickers; Fishsellers; Fieldworkers, Dublin and Carting Sea-weed in the Ards. He also painted local scenery around Dublin and County Down as well as portraits, studio pieces and figure studies. Johnson & Greutzner report five paintings exhibited in the Walker Art Gallery, Liverpool, but it has not been possible to trace the original records. However, the Boydell label on the original frame obviously suggests a Liverpool connection. Henry Thaddeus Jones was a native of Cork where he studied art under James Brennan at the School of Art from the age of ten. Within ten years he had won his first Taylor Prize, which allowed him to advance his career with further study in London. In common with many of the art students of his day, he found his way to Paris and he entered the Academie Julian where he worked under the guidance of Boulanger and Lefebvre. In 1881 Thaddeus left Paris for Brittany where he spent the summer season painting around the historic walled port of Concarneau. He had become a highly accomplished painter whose work was hung in prime position at the Paris Salon. Although he is mostly remembered as a portrait painter, his narrative works and those that record his extensive travels are rare and worthwhile. 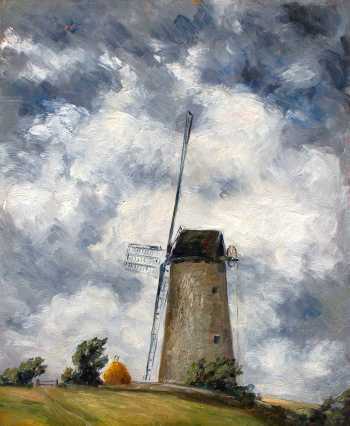 These ranged in style from the plein air works in the square brush manner of Lepage to the highly finished style of the Victorian academy artist. As an inveterate traveller, his journeys took him to the Orient on more than one occasion. Indeed, he returned there in 1891 and built a house and studio the following year in Cairo, but this had as much to do with his appointment as official painter to the Khedive, Abbas II Hilmi, than his desire to escape the dreary European winters. This recently discovered canvas was painted in 1889 while Thaddeus was visiting his friend, Paul Belloni du Chaillu, a French explorer who became famous for his pioneering journeys through the equatorial interior of Africa in the latter half of the 1850’s. Intense light is reflected upwards from the white sand and the white buildings of the city below and contrasts with the cool shadow offered by the ancient walls of the fortress. A blind beggar stands patiently by the gate whilst two elders sit in the searing heat of the early afternoon sun. A solitary figure approaches them on the track from the City below. The dilapidated state of the gate would have appealed to Thaddeus. 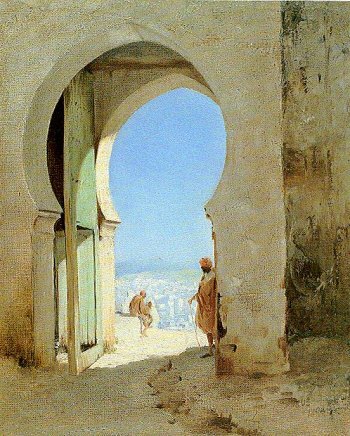 It is the only one extant from the ancient walled fortifications on the high ground that surrounds the city of Tangiers. As an important trading port servicing many caravan routs from places such as the Soudan, the fortifications were necessary to protect the riches of the city from nomadic marauders. Painting in the Orient was popularised by artists such as the influential Jean-Léon Gérome. It became a regular destination for late 19th century artists. Thaddeus is often overlooked as one of the Irish Orientalists, with more attention being given to Hone, Lavery, Garstin and O’Kelly. The latter painted another version of the Kasbah showing two camel riders passing through the gate. Provenance: This painting was recently sold in France with a portrait of Lady Davis, signed by Barry and dated 1924. This was the year of her marriage to the Montreal philanthropist, Sir Mortimer B. Davis. They had a house in Cannes, which is where Barry probably painted the portrait. He may have made their acquaintance during his time spent in Montreal. The son of a magistrate, William Gerard Barry was born at Ballyadam, Carrigtwohill, in the county of Cork. Displaying a natural gift for drawing, he enrolled in the Cork School of Art where he enjoyed the benefit of Henry Jones Thaddeus as master. This course was followed by further study in Paris from 1885 at the Académie Julian and under Le Febre, Boulanger and Carolus Duran. He lived in Montmartre and sent work to the Salon in this year and the following year of 1886. His fist success as an artist was a £30 Taylor prize for a painting he sent to the Royal Dublin Society from Étaples in 1887. He was painting here with Frank O’Meara in a small colony of French, American and English artists. According to O’Meara, they were established along a river, three miles in from the sea. Surrounded by dunes, marshes and woodlands, there was no shortage of subject matter. Situated just twenty minutes from Boulogne, accommodation was more affordable than at Grez. There are worthwhile comparisons to be made between O’Meara and Barry apart from their backgrounds. Barry’s best-known work, Time Flies , Crawford Gallery, Cork, painted in 1887, is reminiscent of the poignancy that runs through the handful of O’Meara’s paintings. Rare as they are, they are not as scarce as Barry’s, whose work is practically unknown on the market. The Crawford painting is the only one in a public collection. His early career was interrupted shortly after his success at Étaples. Almost destitute, following a row with his father, he was forced to work a passage to Canada where he eked out a living as a sign painter. He found his way to America in 1888 and built a reputation as a portrait painter. In 1890, he returned to Paris and studied under Fernand Cormon before returning to New York. His lifestyle was, for the most part, nomadic, which may be one explanation for the scarcity of his work. He travelled to many countries and visited the South Seas. He eventually settled in St. Jean-de-Luz. This extremely rare example of his work shows that by 1911 Barry had become a most accomplished painter in a free and loose style. Among others, it compares to the work of Roderic O’Conor’s Pont-Aven seascapes, especially in the employment of a high horizon line. There is a possibility that this is a Breton work, as it is known that Barry painted there later in his career. There are also similarities to Lavery’s Moroccan compositions in the tonal effects used for the sea and sky. Augustus Burke also painted seascapes very close in style to this painting. 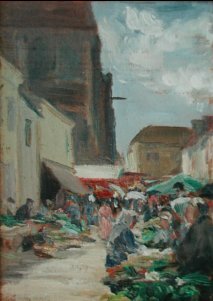 In this loose study of a busy market scene Eva Hamilton displays all the panache and vigour normally found in her early work. The study is reminiscent of the street scenes of Aloysius O’Kelly, May Guinness, Norman Garstin and a number of their contemporaries. Eva successfully captures in paint a joy so often felt when one comes upon a street scene such as this. The panel is most likely to date from 1908, the year Eva exhibited a related work at the Royal Hibernian Academy entitled The Bridge at Moret-sur-Loing. The size of this small panel is identical to other works of the period as is the handling of paint. For example, compare the sky to that of Figure on a Path, Milmo-Penny Fine Art, December 1993. Eva was not alone amongst Irish artists to paint this mediaeval walled town, set in the heart of the Forest of Fontainebleau. Henry Jones Thaddeus may have been the first. He is recorded painting there in 1882, followed later by John Lavery, Roderic O’Conor and the obscure John P. Peacan. The inscription verso, Miss Nellie O’Brien, more than likely refers to the subsequent owner who may have received the painting as a gift. She may have been a friend or acquaintance. At the RHA in 1918 Eva exhibited a work entitled Nellie which almost certainly relates to our inscription. Eva Hamilton studied under William Orpen at the Dublin Metropolitan School of Art. His influence is clearly evident in her early work and his manner in painting the sky became a particular hallmark of Hamilton’s work. This remained apparent well into the 1920s and is very much in evidence in the current work. It is one of the best skies she painted and is every bit as good as her master. The layout of the composition is also typical of her work. She was inclined to ignore the conventional method of breaking a composition into three equal horizontal bands, the top section of which was usually devoted to the sky. Instead, Eva would fill her canvas with the sky and apportion only a thin band of landscape to the foreground. The method is dramatic when it is works as it evident here. The framer’s label allows us to place a fairly accurate date on the painting, which might relate to her RHA exhibit of 1912, On the Suffolk Coast. The mill, which sits on top of gently rising ground, is a likely match for the county. Letitia Hamilton can be described as an Irish avant-garde painter in the true sense of the term. She studied under the powerful and diverse influences of William Orpen and Frank Brangwyn and yet neither tutor is discernable in her work. She absorbed a great deal from these liaisons and through her close association with many leading artists at home and abroad. Paul Henry was perhaps the father figure of her group, which also included Mary Swanzy, Grace Henry and Jack Yeats. Together with Letitia and five other painters, they formed the Society of Dublin Painters in 1920. Over the following ten years, Letitia Hamilton and her group firmly established a new direction in Irish art. This study shows her at her best. Her ability to capture so much detail in the manipulation of paint with a simple palette knife was remarkable. Employing a range of hot colours, the style is individual and instantly recognisable and gives the impression of being sculpted rather than painted. The theme is one which she returned to quite often. At the Royal Hibernian Academy in 1963 she exhibited Kinsale Yacht Race and followed up the year after with a scene from the Schull Regatta. Another Dalkey seascape looking back towards the coastline was on the market recently. 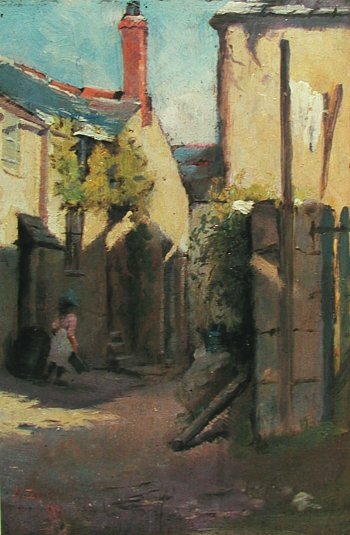 The theme of this painting is one Scully repeats in titles such as A Washing Place at Quimperlé and A Washing Place, Brittany. At The Royal Hibernian Academy in 1896, Scully exhibited a work entitled Evening at Newlyn and it is seems quite likely that this is also a Newlyn scene. Scully made a few visits there, the first being in 1894. He would have felt very much at home there in the company of Stanhope Forbes and Norman Garstin. The painting is nicely lit with bright sunlight finding its way through the buildings and onto the walls and path. The young girl in her pink dress carries an empty basin having filled the line with cloths to dry in the sun. Scully’s work has traditionally been compared to that of Walter Osborne. They shared a common ability to work with the same degree of skill in both watercolour and oil. They both were masters in the art of landscape and portrait work. This sensitive study displays all the control required in a work in watercolour. The young girl in traditional costume clasps a prayer book under her arm. He creates interesting depth and atmosphere by showing a soft glow of light creeping under the door. 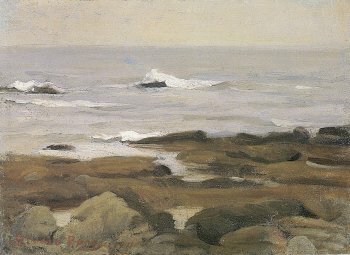 The date of 1896 suggests that this work was probably painted during the visit to Étaples. Scully painted a number of other church interiors, for example, Interior of St. Fiacre, Brittany in 1906 and Two Breton Children in a Church in 1911. 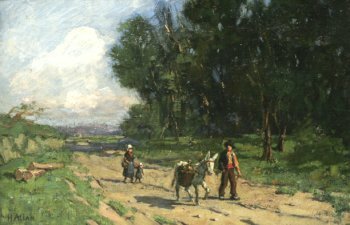 This delightfully tender study demonstrates the influence of Jozef Israels, one of the best-known painters of the Hague School. Scully would have been familiar with his work which, at this time, had become popular all over Europe, depicting the struggle of the peasant in a manner similar to that of Millet. Many of Israel’s paintings are set in a sparse interior and feature a young mother and child. Gently restrained by her mother, the child stretches forward as she tries to grasp a bowl on the table. They are lit from the side by a gently filtered light shining through a curtain. The window is set in a deeply recessed wall. The bench on which they sit is made of coarse timber. A bed has been made ready in the corner of the room. The covering on the bed is the only suggestion of comfort. There is an expression of peace and tranquillity on the mother’s face. Harry Scully turned his back on the world of accountancy and enrolled in the School of Art in his native city of Cork. He progressed from there to Heatherley’s Academy in London, close on the heels of John Lavery, and followed this by further periods of study in Paris. He may have met William Gerard Barry in Cork around 1885. It may have been Barry who encouraged him to join the artist colony at Étaples. Unusually for an Irish artist, he developed a great skill as a watercolour painter but he was equally as accomplished with oil. In 1893, he had established a studio at Emmet Place in Cork from where he offered instruction in the art of painting. His working trips took him to Normandy, Brittany, Italy, Holland and England. His subject matter was wide-ranging and recurring themes include atmospheric moonlight and evening scenes; marshlands and rivers; cottage and church interiors; farmyards and rural scenery. He made his exhibition debut at the Royal Institute of Painters in Water Colours with six exhibits in 1887. He sent his work to the principal London Galleries, including the Royal Academy, and exhibited regularly at the Royal Hibernian Academy up to the year 1932 and was elected as a member 1906. He eventually settled in Kent where he lived out the last years of his life. In 1906 Constance Gladys Grimshaw married Col. Conn Alexander, the third son of the Earl of Caledon, Castle Caledon, Co. Tyrone. 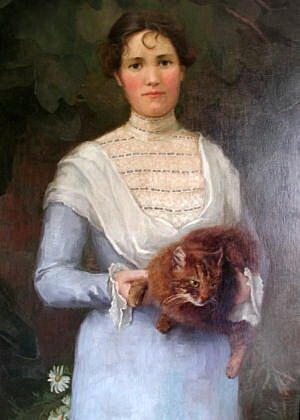 She was the daughter of Thomas Wrigley Grimshaw C.B. M.D. Col. Conn Alexander's eldest brother was the fourth Earl of Caledon and father of Viscount Alexander of Tunis, Col. Harold (Alix) Alexander. Col. Alix was a very competent artist and went on frequent painting trips with Churchill. This portrait was probably painted about two years after her marriage. Purser’s career spanned one of the most important and exciting periods in the history of Irish Art. She played a central role in the establishment of An Tur Gloine and was the main force behind the formation of the Friends of the National Collections of Ireland, a movement which remains very active to this present day. She will also be remembered for her work in the foundation of the Hugh Lane Gallery of Modern Art, Dublin. She studied at the Academie Julian in Paris and on her return to Dublin she successfully established herself as a leading society painter. She maintained contact with France for many years and made a number of return visits there. Through her many notable artistic associates in France and elsewhere she managed to keep abreast of new developments and trends in European art. From Mespil House she became a popular hostess to Dublin's literary and artist circles. Throughout her long career Sarah Henrietta Purser was a regular contributor to the Royal Hibernian Academy exhibitions. John Butler Yeats is better known as a portrait painter and as the father of the poet William Butler Yeats and the artist Jack Butler Yeats. Indeed, one of the reasons for spending the last fourteen years of his life in New York was that there, he could be the head of an illustrious family and avoid the comparisons proximity would have brought. After boarding at the Atholl Academy on the Isle of Man, John Yeats did not follow his father and grandfather into the Church, but read law when he entered Trinity College, Dublin in 1857. In 1863 he married Susan, the sister of his fellow pupil at Atholl, the astrologer George Pollexfen. Yeats was called to the Bar in 1866, but a year later quit law for art and went to London to study at Heatherleigh's Art School. He was back in Dublin between 1880 to 1887 but returned to London where he became part of the circle of leading artists and writers. In 1901 he was invited by Hugh Lane to paint a series of portraits of those prominent in the Irish Revival. George Russell wrote of his enchanting flow of conversation which lightened the burden of sitting. This success enabled Yeats to settle in Dundrum until he went to America in 1908. He stayed there until his death in 1922, writing, painting and lecturing. Joseph Hone wrote in his memoir of him that he was never known to make a plan and had the 'conviction, even at 80, that he was on the verge of new advances'. 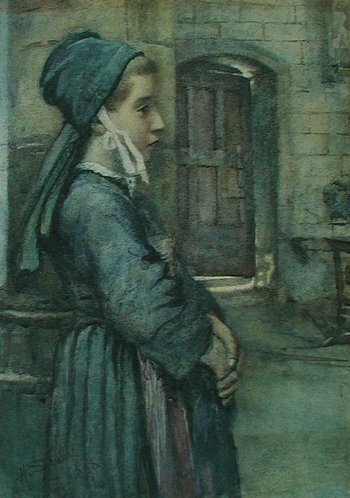 In the early 1880s Yeats was not so consumed by his portrait practice and found time to paint a number of studies such as this portrayal of life on the Dublin streets. He was working from a studio at 7 St. Stephen's Green, which may be a likely location for The Flower Girl. The boy in the background was one of many urchins willing to clear a path across the road for a farthing, thereby saving the ladies fancy shoes and trailing hemlines. Although he was a prolific painter Kavanagh’s work is extremely rare. As Keeper of the RHA, he was a resident in their premises on Abbey Street when the buildings, including his studio and paintings, were destroyed by fire during the 1916 rebellion. The only surviving works are those which had left his possession before the fire. Kavanagh was lucky to escape with his life from the burning building but he never fully recovered from the tragedy. In the early years Kavanagh’s career follows a path similar to that of Osborne and Hill. The main body of work shows local studies from home followed by views in Antwerp and the surrounding Dutch countryside and numerous studies of life in Brittany. Unlike Osborne he does not appear to have worked extensively in England and became more of a local painter than Osborne on his return to Ireland. Although Osborne and Hill developed almost identical styles, Kavanagh’s work is more individual in style. Painters are often attracted to reside in areas where they can find good subject matter without the need to travel far afield. From his base in Clontarf Kavanagh painted numerous views around Howth and its environs, many aspects of Dublin Bay and his famous views on the sands of Portrane, Sutton, Portmarnock, Merrion and the North Bull where, in 1893, he painted Cockle-Pickers on the North Bull Sands. In this same year he painted our view of The Meadow Water at Swords. This introduces another popular theme for Kavanagh and many titles relate to this, for example, Portmarnock Marsh, Killester Ponds, Beside the Marsh, Portmarnock, A Salt Marsh and The Quarry Pond. Another related group entails views taken along Dublin’s riverbanks. In terms of handling the current painting relates closely to Between the Autumn and the Spring, 1905, A November Evening, 1904, National Gallery of Ireland and Dartry Pond, 1911. The topography suggests a location just inland from the estuary, close to Lissen Hall. The composition compares to works such as Woodland Pastures, Crawford Municipal Gallery, Cork, exhibited at the RHA in 1902 and The Stately Elm, 1903. Parkland settings were a favourite with Kavanagh. Alongside this painting at the RHA of 1903 he exhibited a related painting, In Rathfarnham Park. Another distinctive motif of Kavanagh’s work is displayed here - in many of his paintings a tree soars to the edge of the canvas to form a focal point and add strength to the composition. Hugh Lane Municipal Gallery, Dublin. In his introduction to the catalogue which accompanied the May Guinness Memorial Exhibition in 1956, Dr. James White described May Guinness as "the first of her race to paint her way into the heart and spirit of the new movement of the 20th century". May Guinness was indeed one of the most innovative Irish painters of her time. Both she and Mary Swanzy were the first Irish exponents of the International Modernist style. Experimenting with modernist styles some 15 years before Mainie Jellett and Evie Hone, May Guinness is all the more exceptional when one considers that she belonged to the generation of Osborne and Lavery. She was four years younger than Osborne and seven years younger than Lavery. Her confinement to the family home at Tibradden, Rathfarnham during the 1880s was due to the responsibility imposed upon her of her younger brothers' and sisters' education combined, in 1888, with the death of her father. Therefore, her career as a painter began at a relatively late stage. It suffered further interruption with the outbreak of the First World War during which time May Guinness was living in France. She joined the French army as a military nurse and in 1917 received the Croix de Guerre for bravery. Though she is recorded as having studied under Norman Garstin at Newlyn in 1894 and later in Belgium circa 1905, her real development did not occur until 1905-1907 when she went to Paris. There, she immediately came under the influence of Matisse and the other Fauves, whose works were to be seen at the Salon d'Automne and the Salon des Independants, and later the Cubist works of Picasso and Braque. The synthesis of these two styles as seen in the paintings of the Ecole de Paris strongly influences her throughout her career. Her early work testifies to her admiration of Matisse, in particular. From 1905 to 1922 she variously studied under Fauve painters Ermenagildo Anglada-Camarosa and Kees Van Dongen and from 1922 to 1925 under the Cubist painter Andre Lhote. The latter, in his introduction to the catalogue which accompanied her exhibition at the Gallerie Visconti, Paris, in 1925, referred to her as "a promising artist and one that has worked hard to encourage and develop Modernism." In her 1992 catalogue entry, Christina Kennedy observes: After 1925, May Guinness returned to a free, descriptive, essentially Fauvist approach to painting having tired of the formulaic Cubist method. At 72 years of age she declared that she had completed her experiment and was now settling down to explore "flat rhythmic arrangements of line and colour". May Guinness contributed to the Salon d'Automne, exhibited with the Dublin Painters Group and the Irish Exhibition of Living Art. During her long life she collected paintings by Picasso, Matisse, Bonnard, Rouault, Dufy and others. At her weekly tea-parties, held in her studio at Marlay Courtyard she gathered friends and younger artists, including Jack B. Yeats, Mary Swanzy, Evie Hone, Mainie Jellett, Father Jack Hanlon and many others. She was a great source of encouragement to them. As Dr S. B. Kennedy points out, it is very difficult to chart the development of May Guinness' work as she rarely dated her paintings and in all her one-woman exhibitions she showed a combination of recent and past works executed in various styles. 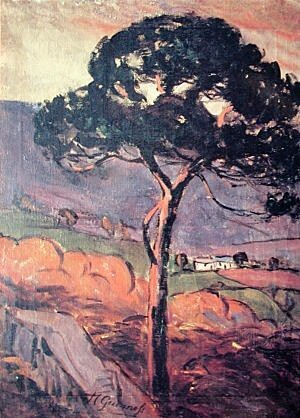 However, Umbrella Pine in a French Landscape most probably dates from her early, pre-Cubist days in Paris and is possibly as early as 1907. This painting bears a strong resemblance to A Pine Tree at St. Tropez painted by Albert Marquet in 1906. Marquet and Matisse, who were close friends, frequently worked together in the south of France, sometimes with Signac who had a villa at St. Tropez. Although painted on a horizontal canvas it too features a centrally located pine tree against a mountainous background at the base of which nestles a scattering of small, cube-like, white houses. Though May Guinness, in addition, depicts a large purple rock at the foot of the tree and in the middle distance disposes a belt of burnt-orange boulders, the elements of her composition are essentially the same as those of Marquet. 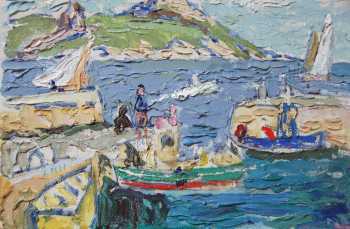 Her mauve, orange, pink and deep green colour scheme though bolder, brighter and more characteristically Fauve than that of Marquet was no doubt inspired by the paintings of Marquet's fellow Fauve exhibitors. Of all the Fauve painters Marquet's palette was the most tonal, but, as Matisse explained in an interview with Jacques Guenni in 1925, "Marquet did not have enough money for colours ... perhaps this economic condition flavoured his style". Though it is hypothesis, it is very likely that A Pine Tree at St. Tropez was on exhibition with other Fauve works in Paris in 1906-1908. Marquet exhibited at the Salon des Independants from 1901 to 1910 and at the Salon d'Automne from 1903 to 1910. His work was also to be seen at the Berthe Weill and Druet Galleries at the time. If this was the case, May Guinness would undoubtedly have seen this painting. Coming from a family noted for their academic brilliance, Mainie Jellett excelled not only in painting, but also in music, a gift she inherited from her mother. Mainie carried a great love for the piano with her to her tragic death in early 1944. She was, however, destined to be an artist from a very early age and was taught painting by Elizabeth Yeats, May Manning and later William Orpen at the Metropolitan School of Art in Dublin. In 1917 she left Ireland for London and the Westminster School of Art, where she studied under Walter Sickert. It was in London that she first met Evie Hone who was to become her life-long friend and companion. In February 1921 she travelled to Paris where she became a pupil of Andre Lhote, providing her first encounter with Cubism. She considered Lhote's ideas a compromise, however, and in December of the same year she went with Hone to Albert Gleizes in the search for a more abstract form of art. In 1923, after two years with Gleizes, Mainie Jellett exhibited her first totally abstract paintings at the Dublin Painters Gallery in St. Stephen's Green. She was to exhibit here frequently for much of the rest of her life, including in 1924 her only joint exhibition with Evie Hone. It may be said of Jellett that her work lacks originality and is to close in style to that of Gleizes. However, there is only a grain truth in this. She had the ability to take her own chosen subject matter and portray it in the manner of Gleizes. It must be remembered that Gleizes himself had been influenced by others. That's the way it works. On the plus side, there is nothing cheap about Jellett's abstractionism. She was not using abstraction as an escape route to avoid the difficulties of traditional easel painting as is so often the case with far too many impostors. The painting shown here demonstrates Mainie's skills and abilities. 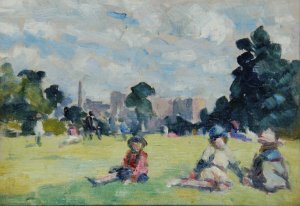 Broadly painted, free and colourful, the sketch captures a summers day in Dublin's Phoenix Park where the Jellett family relax on the grass after a tram ride from the city centre. Painted about 1920, it displays an abandon which is to be found in the happy and informal sketches of her family, which Mainie produced at this time. The provenance of the painting is interesting. Mainie's sister, Betty, married Sean Purser, Elizabeth Fitzpatrick's brother. In the year 1900, Emily Grace Mitchell met her future husband, Paul Henry, while studying art in Paris. They married in 1903 and set up home in Surrey. In 1912, they set out for a short holiday on Achill Island; a journey which effectively lasted for eight full years and the birth of two fine Irish painters. Grace had gone to Paris at the age of 32 even though she was already well established as a painter. She had exhibited with the Aberdeen Artist's Society in her native Scotland in 1898. In 1924, at the age of 55, she returned to Paris for further study with Andre Lhote, following the same course as Evie Hone and Mainie Jellett three years earlier. Her work is distinguished by her bright range of colours rather than her style, which is somewhat eclectic. In her painting, she responded readily to the people and environment she found herself in. This variety presents many surprises and is one of the reasons why she has such a strong following. In Hills of Connemara, a familiar row of smoking white cottages hugs the hillside as two figures labour in a small lakeside field. The picture relates closely in handling to one of her best known Achill works, Top of the Hill, (Limerick City Art Gallery). 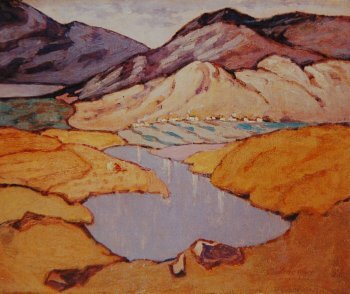 In these paintings, her technique was to fill a dark outline with strong bold colour, somewhat reminiscent of the work of Elizabeth Rivers. Oil on canvas, 15 x 20. Signed by the artist and inscribed verso with title. From an early age, Frank McKelvey displayed an exceptional talent. He was awarded the Brett prize for figure drawing at the age of sixteen. This was the first of a number of prizes which he gained during his student days at the Municipal Technical Institute in Belfast. Following his final year in 1918, he built a successful career, and became an associate member of the Royal Hibernian Academy within ten years, and a full member seven years later. He was also a member of the Royal Ulster Academy. He was born in Belfast in June, 1895. His father was a decorator and it is interesting to note that a number of other successful artists came from a similar background. 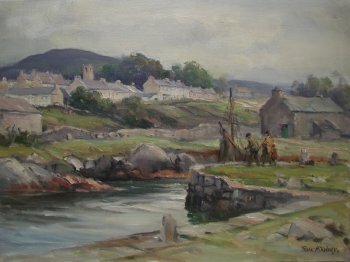 During the 1920s, he worked from a number of studios in Belfast where he became well know for his depiction of the Irish landscape. His final move was to Hollywood, Co. Down in 1967. He was a most prolific painter, producing numerous river and coastal views from Donegal, Connemara, and Antrim along with many farmyard scenes. From 1951 onwards, he made frequent painting trips to France where he produced some of his best works. He was also a painter of portraits and was as proficient in watercolour as he was in oil. His work is found in public collections in Brussels, Ottowa, Glasgow, London, Dublin, Belfast, Waterford, Cork and Limerick and elsewhere. Edwin Hayes was born in Bristol, but spent his youth in Dublin, where his father kept the Bristol Hotel and Tavern in Marlborough Street. His main ambition in life was to become a marine painter and to this end he registered as a student with the Dublin Society Schools. He eventually set up a studio in Dublin from which he regularly sent work to the RHA. In 1852 he moved to London and found employment as a scene painter at the Adelphi Theatre. He resumed his exhibiting career at the British Institution with a view of the River Liffey and the Custom House. He sent his first painting to the Royal Academy in 1855 and continued to exhibit there for the next fifty years. He painted mostly in oil, but he was also a fine watercolourist. Much of his work depicts shipping in high seas and harbour scenes with French and Dutch luggers around the coasts of Britain and Ireland. These must have reminded him of his visits to the ports of France, Belgium, Holland, Spain and Italy, many of which he recorded in paint. His great knowledge of the sea allowed him to paint it in all its moods and glories, whether this was a raging storm or a flat calm. These skills are to the fore in this example, which shows a sailing ship battling against a furious sea. The dark foreboding sky above the ship adds dramatic effect to the crashing white water lit by a momentary burst of strong light that breaks through the storm cloud. The tiny figures leaning over the pier wall signify the sheer power of the ocean and the magnitude of the scene played out before their eyes. One of his earliest French seascapes was a study in the Bay of Cancal, which he sent to the RHA in 1862. This was followed a few years later by a number of views along the coast between Portel and Boulogne. Calais is just a short distance away and it is likely that the present work was painted at this time. 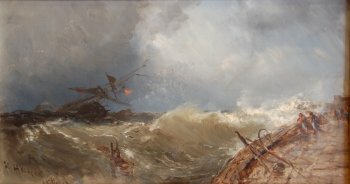 This dramatic scene might have been inspired by Turner’s famous painting, which depicts a raging storm with shipping off the old timber wharf. The buildings and flagpoles at the end of the pier are also found in an earlier watercolour by David Cox. Other paintings of the period show the stout, protective timber planks that line the pier wall from the seaward side. Literature: Brendan Rooney in W. Laffan, ed., The Sublime and The Beautiful: Irish Art 1700-1830, London, 2001, pp.170-7, no.17, illustrated. James Arthur O'Connor was born in Dublin about 1792. The son of an engraver and print-seller, O'Connor gained his earliest exposure to the visual arts in his father's shop and may also have studied under William Sadler (c.1782-1839). Already exhibiting in Dublin as a teenager by 1809, O'Connor left for London in 1813, intending to settle there. On his return in 1818, he was taking commissions for topographical views from important patrons such as the Marquis of Sligo and the Earl of Clanricarde. In 820, he was awarded a premium by the Royal Irish Institute. 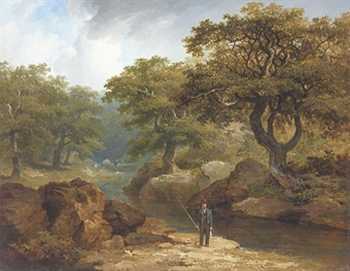 By 1822, he was back in London exhibiting Irish views at the Royal Academy and the British Institution thereby helping to stoke the English taste for characteristically Irish landscapes that had been ignited by George Barret in the preceding century. O'Connor's landscape style during this period was inspired by the British picturesque movement, presenting views distinguished by the rugged and varied character of the landscape. His vigorous use of impasto served to evoke the reality of the countryside with an immediacy that is equally served by his cleverly grasped compositions, where loops and bends around receding trees draw the viewer into the scene. The most important watershed in O'Connor's career comes in 1830 with his second return trip to Ireland. “I am going to the wild and beautiful scenery of my native country to refresh my memory”, he wrote in August of that year, “I know that I will be benefited by a sigh of the grand scenery I will meet in Ireland, and hope to show it on canvas” (quoted in J. Hutchinson, James Arthur O'Connor, Dublin, 1985, p.151). His works after this moment become more deeply Romantic, invoking Burke's notions of the Sublime in nature, as mediated by George Barret. A previously uncatalogued date of 1836 in the present picture places it securely in this second period. The Site Map and Artist Index will help you find your way around our pages. Go to the Sales pages on the menu bar to the left of this page for details of paintings currently available. The Archive pages illustrate paintings we have sold in the past, and indicate the type of paintings we are interested in purchasing. Please note that some of the paintings in the archive may be available. Please enquire. Milmo-Penny Fine Art Ltd. issues a written guarantee of authenticity and a condition report with every painting sold. © All text and photographs on this website are protected by copyright worldwide.